The Pittsburgh Post-Gazette, and its recently hired editorial director, Keith Burris, may be on the verge of another controversy over the direction of its editorial page. 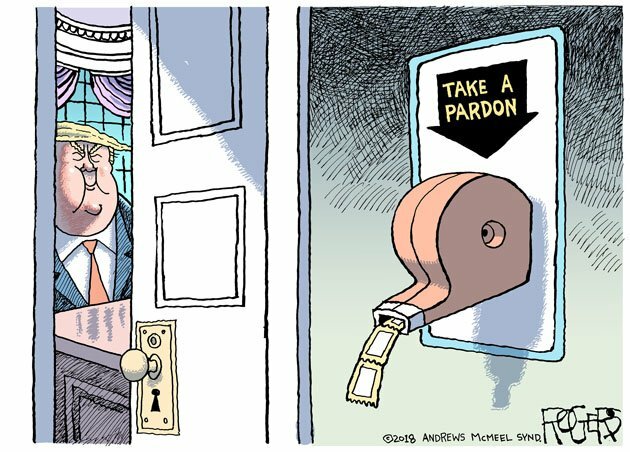 Over the past week, the paper has not published five cartoons by its editorial cartoonist, Rob Rogers. Rogers routinely posts his cartoons on Twitter and Facebook, but none of the work he posted last week appeared in the Post-Gazette. The most recent cartoon the paper posted online is dated May 23; it was also published in the May 24th print edition. Some of the cartoons Rogers has posted since mocked President Donald Trump -- with whom publisher John Robinson Block was photographed during the 2016 election. Others, like the cartoon referring to Barr, did not refer to the president. 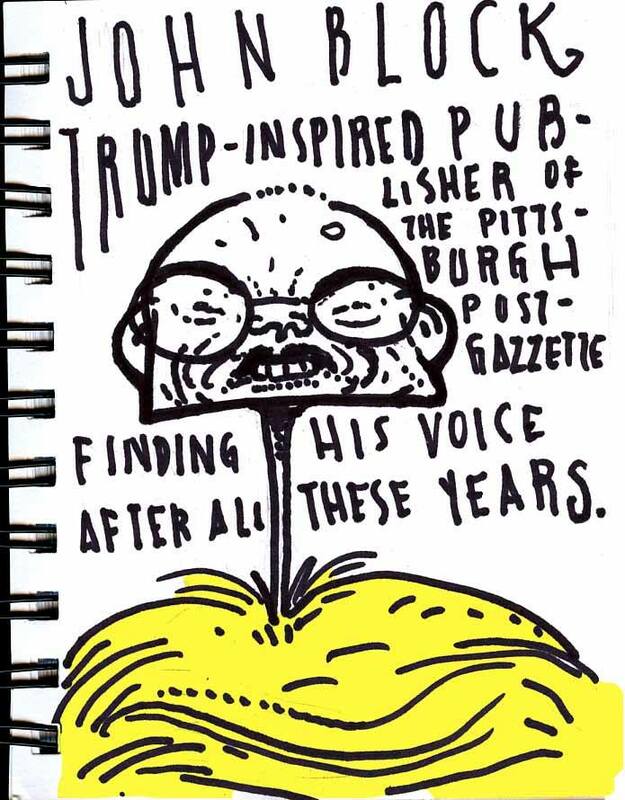 Rogers has been cartooning in Pittsburgh since 1984, and his work has been reprinted in national publications including The New York Times and The Washington Post. While the Post-Gazette’s newsroom is unionized, Rogers is not a union member and thus has fewer protections from termination. Sources inside the paper confirm he was still employed by the paper as of Friday. Burris had previously been the editorial-page editor for the Post-Gazette’s sister paper, the Toledo Blade. The Post-Gazette printed that editorial on Martin Luther King Jr. Day: its publication prompted condemnation from newspaper staff, the leadership of local foundations, and other members of the Block family. Burris was promoted to the post of vice president, editor and editorial director for both Block papers in March. 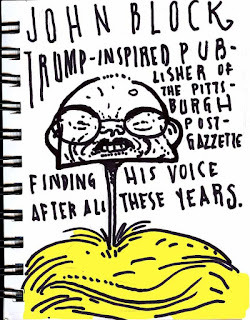 The longtime cartoonist for The Pittsburgh Post-Gazette has gone missing. Actually, we know exactly where Rob Rogers is—at his desk creating the excellent award-winning editorial cartoons he is famous for. But it’s those cartoons that have been missing for over a week from the Post-Gazette editorial pages, though we know Rob is drawing them because new cartoons are being posted on the web. It doesn’t take much to connect the dots between the absence of Rob’s left-leaning cartoons and the recent arrival of a Trump-supporting editorial page editor. We would take this opportunity to remind all editorial page editors that their responsibility is to the readers (among whom in Pittsburgh, Rogers cartoons are wildly popular) and to the open and ongoing search for truth in contending opinions. The editorial pages are a public forum, not a members-only private resort in Florida. This is a story of the slow bleeding to near death of one of the great editorial cartoon careers in the country and also, more broadly, the loss of decency in positions of power as the Trump Effect gives people everywhere license to exhibit long-held authoritarian, nationalist and racist tendencies. 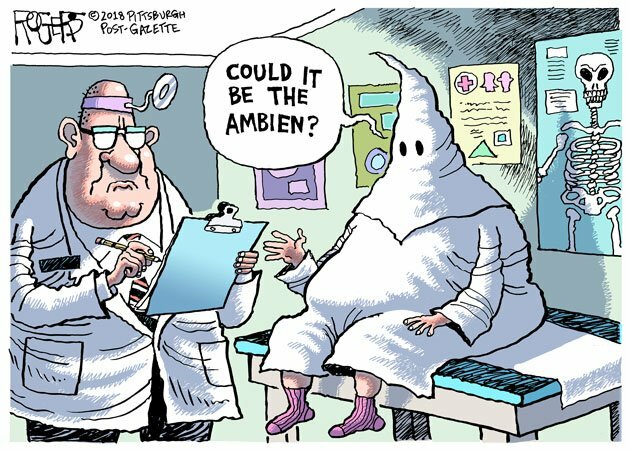 Rob Rogers, editorial cartoonist for the Pittsburgh Post- Gazette, is one of the best in the world. His gifts are very special. I have called him the Venus fly trap because his toons are immediately entertaining and then, on further inspection, reveal insight and power. He has won just about all the awards the field has to offer. And, as it happens, is as decent and honest a person as you will find in this or any field. For the last ten years his publisher JR Block, a conservative man from a publishing family, which owns the Toledo Blade, has had a respectful hands-off approach to Rob’s work. Since the election of Trump that all has changed. Block has changed. With the currents of anti-immigration, attacks on the constitution, media, courts and apologies for racism, people everywhere, Mr. Block in particular have become emboldened, like the Republican Party to walk and talk like Trump. Not long ago Block hired editor Keith Burris, whose achievements include a widely derided editorial defending Trump’s “shithole” defamation of Haiti and other needy and developing countries. This would be the man now overseeing the work of Rob Rogers. You can pretty much write the rest. This began the gradual withdrawal of support of Rogers’ work. He began spiking Rogers’ cartoons. There have been 17 killed so far (one per year is the norm). They have only printed one since Memorial Day. Rogers’ lawyers were then told that he would remain at the paper if he gave up his autonomy as a cartoonist and submitted all ideas in multiple sketch form early in the day and then would only be permitted to proceed after heavy editing by staff. They knew that this would be no way to create anything of editorial value. An editorial cartoonist who is not a beginner (Rob, again, is a decorated veteran of 35 years) is left alone, trusted in his judgment and connection to his readership. This was a clear attempt to grind him down and force him out. I don't know what Rogers’ options are at this point. One would doubt the capacity of these trends to turn themselves around. But it is, to me, the job of the graphic arts, media community and the nation at large to raise its voice as one in protest. Freedom of speech is established for cartoonists and columnists as a given. They are not subject to fashion. The right of artists and writers to remain free, especially in times of constitutional crisis must be inviolate. 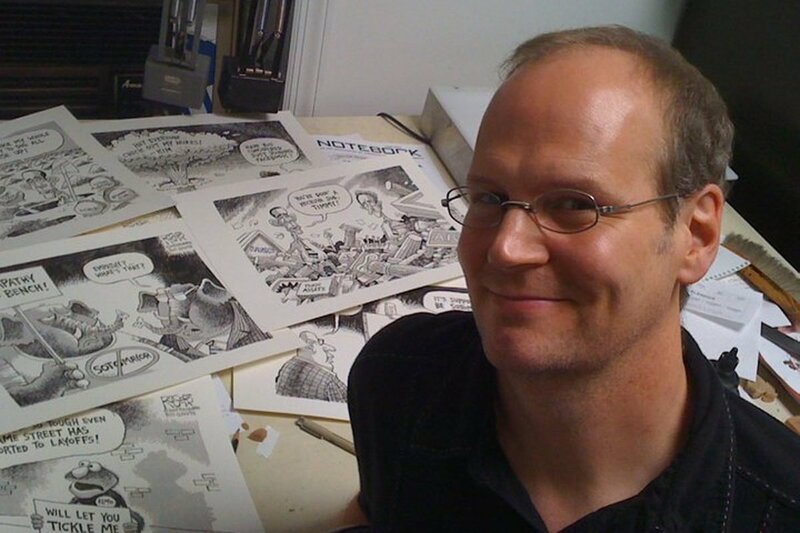 The absolute worse thing now would be silence surrounding the silencing of Rob Rogers. "Anti-Trump Cartoons Stopped by Censor at Pittsburgh Post-Gazette" on FAIR. "Killing Editorial Cartoons Is Not Fake News" in Print.